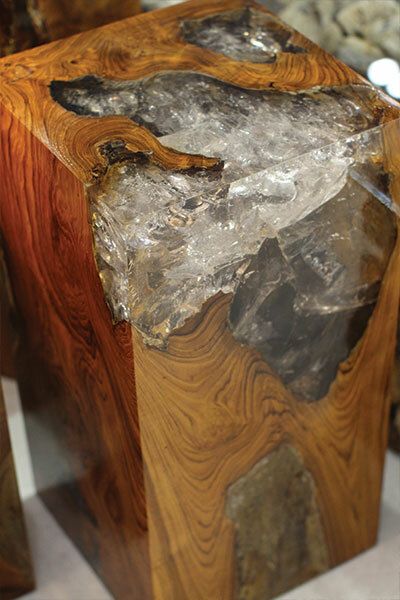 Our beautifully unique teak and resin furniture is made using reclaimed pieces of wood that have naturally occurring indentations. In order to give the pieces of wood a regular shape and a smooth, usable surface, the gaps are filled with clear or coloured resin. As the resin sets it cracks naturally, this gives the block a ‘shattered’ finish through which light diffracts and creates stunning glistening light patterns. 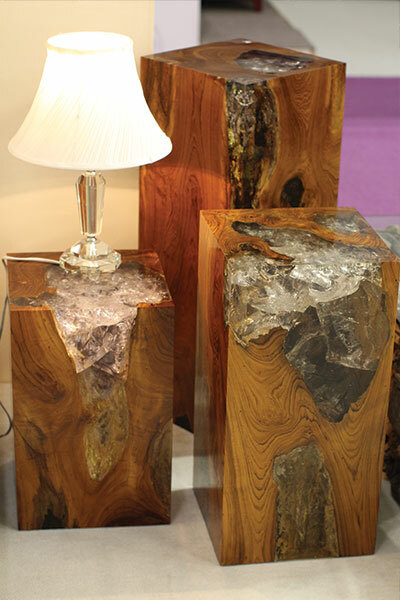 We sell the blocks as single decorative pieces, or as functional art tables (blocks topped with thick toughened glass). Our teak and resin blocks are available in a number of colours, as well as clear. 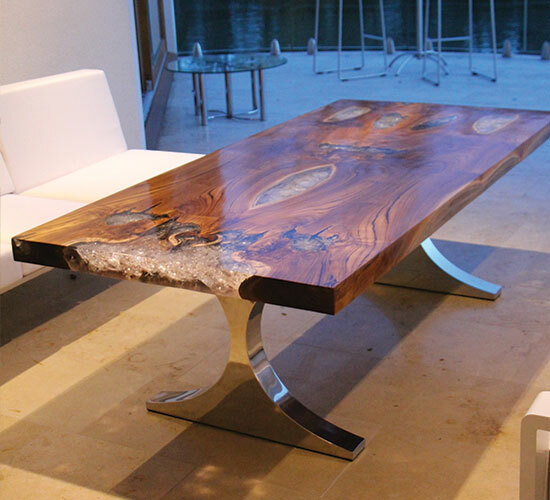 The resin sits flush with the stained teak and is an eye catching contrast. Both clear and coloured resin is available – popular colours include red, emerald green and aqua. Blocks can be made to order using a resin colour that matches your décor, furniture, or focal points within your home. 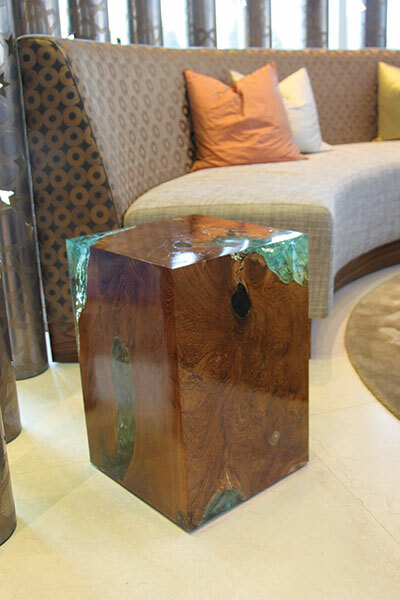 To create our teak and resin tables, the blocks are topped with a thick piece of thick toughened glass (19mm or 15mm). Dining tables, coffee tables, and consoles are all available to order. 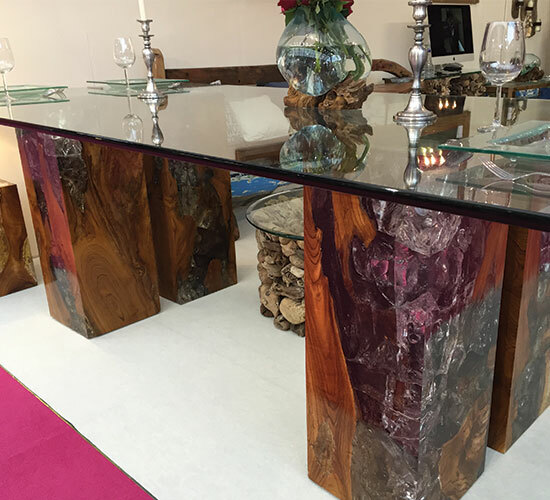 Tables are available in ‘classical’ clear or coloured resin – popular colours include red, emerald green and aqua. We are happy to take orders for bespoke designs that match your décor and fit perfectly in your home.